Goebbert’s Fall Festival starts September 15, 2018 and runs through Halloween. We are a great place for families to come and have a great fall day. Come enjoy the animals, watch a pig race, see our famous Pumpkin Eating Dinosaur, have some lunch and pick out a pumpkin. We have plenty of fun attractions for the whole family! Also make sure to stop by the Red Barn Cafe & Bakery for some tasty treats, including our famous Apple Cider Donuts and Pumpkin cookies. Come see 50 different types of animals in our large Animal Land. You’ll find all your barn yard favorites including cows, pigs, goats, and baby chicks. You’ll also find a large array of exotic animals such as camels, kangaroos, llamas, zebras, tigers, bear cubs, lions and even a giraffe or two. We have birds from around the globe including owls, macaws, and toucans. Many of the animals can be spoon fed. Admission to Animal land includes Little Farmer’s Play yard. Let the kids run, jump and climb on all kind for fun things. We have a playground, wooden train, fire engine and tractors. 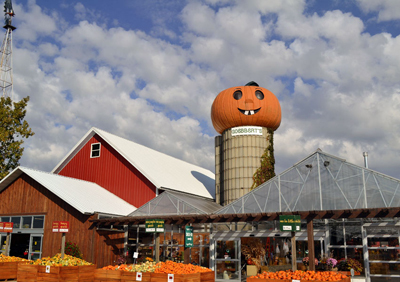 Kids will love the pumpkin tunnel, character cutouts, pumpkin hut, and straw town maze. Everyone will love the corn hole game, ring toss and weekend magic show; corn box and Charlotte’s Web are great for all ages. Little Farmer’s Play Yard is included in your animal land admission. Great fun for the whole family and so much more! Visit Goebbert’s online for more information. Sign my up for the family of 4 tickets. Great place to have family fun and their Halloween room is awesome. Sign me up for the family fun pack give away. Love Goebberts. Their Halloween display is awesolme. Been saying for years we were gonna do this! Let’s go! Going to Goebbert’s is always the thing that kicks of the Fall season for our family. Especially for Halloween! We took our kids here and now we take our grandchildren. It’s been a family tradition for decades. I’ve been going to Goeberts for 25 years, with my grandparents. It’s been a family tradition that I absolutely love and have passed down to my two children. It would be so much fun to won this package so my children can experience some even more fun throughout the day. We love feeding the animals, seeing the decorations, and playing in the corn pit. But the best part is picking out our perfect pumpkin to go home to cave and bake seeds! I’ve been going to Goeberts for 25 years, with my grandparents. It’s been a family tradition that I absolutely love and have passed down to my two children. It would be so much fun to won this package so my children can experience some even more fun throughout the day. We love feeding the animals, seeing the decorations, and playing in the corn pit. But the best part is picking out our perfect pumpkin to go home to carve and bake seeds!